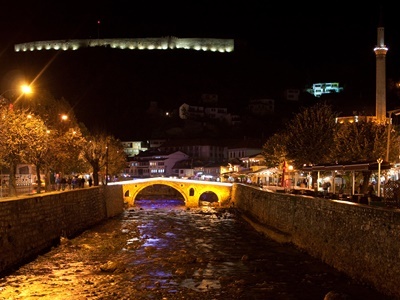 If you only have time to visit one city in Kosovo, then you should visit the center of Prizren. This Kosovar town is strongly influenced by the Ottoman Empire and has beautiful traditional buildings. Thanks to the European taxpayers, many of the city highlights have been restored after the war and are accessible for everybody. The fun starts after parking your car. Do not park it too close to the historical center of Prizren. Try to park it in the area of the NATO monument and walk from there via the main shopping street to the old part of Prizren. This shopping street contains numerous jewelry and wedding dresses shops. Very interesting to see. Especially because you learn immediately about the traditional wedding clothing of Kosovo. When entering the historical part of the center of Prizren, you have to cross a stream via a very old stone bridge. When you look around you, you will see the fortress (Kalaja), houses on the hill, minarets and even an old Orthodox Church. The city has many interesting buildings to see. Like the Turkish Hammam, which they are renovating. But also the street with a beautiful Serbian church, an impressive huge mosque and a Roman Catholic cathedral is special. Try to visit all of the religious buildings. You can climb the fortress by following the signs Kalaja. The mountain looks high, but the walk is not more than twenty minutes. The first minutes are the steepest. 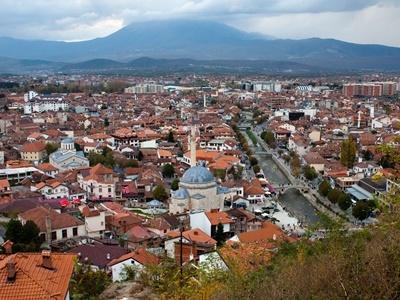 From the top, you’ll have a stunning view over Prizren and you can count dozens of minarets. When you walk to the other side of the fortress, you have an amazing view over beautiful mountain road that leads to Macedonia. After visiting the city, you can drive by car through the mountains on the road to Macedonia. But do this only with daylight. Otherwise, it is not that interesting. Looking for a hostel in Prizren? Drizas House is situated in the center. Find more information on their website or call +38649618181. As a tourist,you can witness the traditional metalsmithing technique (filigree), which is popular in Prizren. “…minarets AND EVEN an old Orthodox Church.” Prizren was built in the 14th century by Serbian Car Dusan. It was the capital of Serbian Empire. City used to have 351 Orthodox Churches, but Turks and later Albanians destroyed all of them. Now, only ONE out of 351 is rebuilt and open. How come just Serbian historians say that and no other does ? !…Let me put the question in another way…None of your posted information can be found in any historic sours (historical archives) in the entire world,…just you (Serbians) have your own history, and your way of interpretation, that doesn’t match with no other in the world. You are talking about the period of the 14th century, when the notion of “nation” did not not existed … so how is it possible that you are talking about a period of history that,Serbia as a nation was not part of it?!!! But you poor people are not guilty,for the fact that your leaders always had ambitious to dominate the Balkans, and have not chosen a way, or means to argue it, even with lies, deception and fraud… !!! Serbs came at the end and gone with a wind buddy after all those genocides they made at this country. Anyone know of any sufi ritual i can join\view on May 11 or May 12 2017? I will be there. Dear Habib, you might contact one of the hotels, listed below. They probably know more information. We advice you to google for that, Habib! Thank you for your help! Will get that done!